Sometimes, it can be hard to find the time to do cleaning jobs around the home. Or maybe you don’t feel confident doing it yourself. For us, it’s simple. Leave the hard work up to us. Say goodbye to that layer of dirt and grime. Hot Water pressure cleaning delivers unparalleled results allowing us to clean deeply soiled areas including oil, mould & mildew. Ask us for more details. The results will speak for themselves. We pressure wash driveways, rock features, tiles and courtyards using commercial pressure washers. We take great care to ensure your paint and exterior is kept intact. Let your windows sparkle and shine. 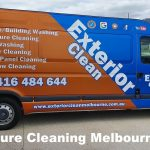 We clean windows, frames, sills, cobwebs, fly screens, bistro blinds, conservatories, glass balustrading, pool side glass and more. Using the latest in window cleaning technology, our telescopic waterfed poles are carbon fibre and can clean up to 7 storeys safely from the ground leaving spot free clean windows. Professional equipment and natural products are used to remove hard to remove stains from glass, sills and frames. Safety is our priority when cleaning gutters. Our people are trained professionals who are Working Safely at Heights Accredited. When we’re on your roof we take note of the conditions of the tiles, roof screws, skylights, wiring etc, and will take photos of any concerns. Depending on your roof pitch we may have to install temporary anchor points, which we can do easily on both tile and tin roofs. We use specialised roofing footwear, harnesses, ropes, anchor points and ladder stabilisers (as required). Our gutter cleaning service includes flushing down spouts (to check they are clear). If you have a simple blockage we’ll even remove and clear it from the down pipe. Manufacturers recommend regular cleaning of solar panels to ensure maximum efficiency. You can expect to increase your efficiency by 30-50% (as a minimum). Rain alone doesn’t clean your solar panels as dirt, debris and bird faeces all coat your panels reducing their efficiency. We clean your panels with our purified waterfed telescopic pole system using soft brushes and a quality result so you receive maximum savings in the long run.